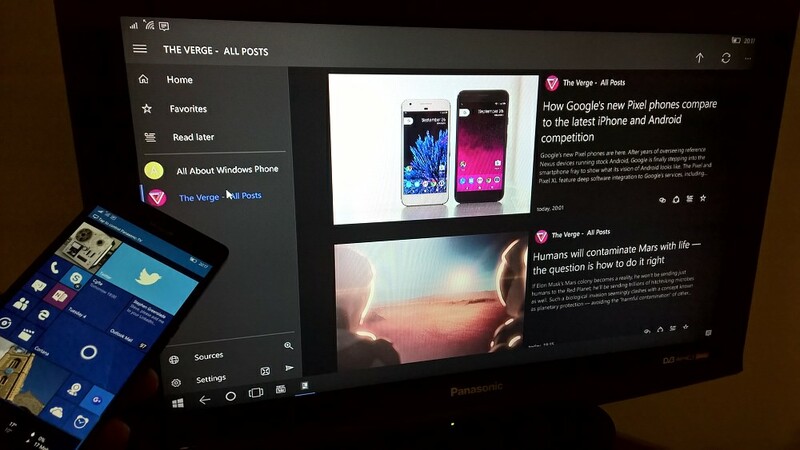 Another day, another sumptuous Universal Windows Platform application to review... This time it's something that's both old-school and exciting at the same time. RSS (XML, ATOM) news reading sounds like something technical that's too much work to set up, but with Newsflow, after an initial customising period in your hands, you'll have access to bang up to date news sources with minimal effort. The idea behind RSS (and adapted in other hypertext and object-based systems) is that news sites (like AAWP!) can automatically publish a machine-readable version of their main content - this will typically contain the various meta-text, keywords, titles, perhaps an image or two and an opening paragraph for each story. In this way, news sources can be indexed and accessed from anywhere online without someone having to manually wade through a myriad site layouts. 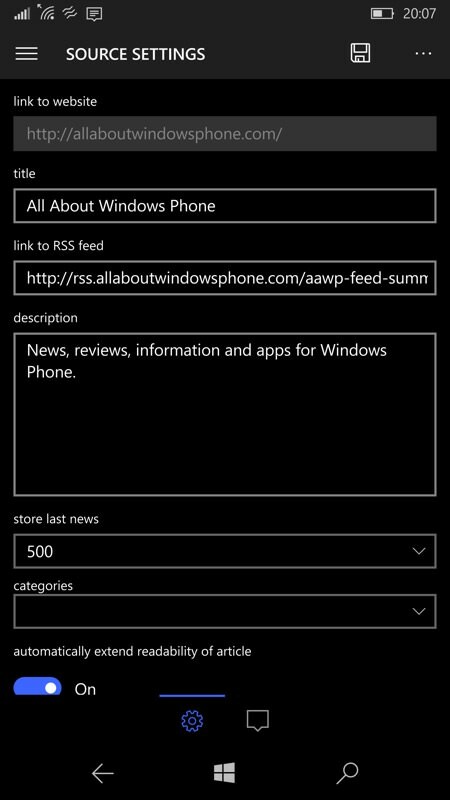 Newsflow then, is a RSS reader (and including the various other formats), letting you build up (or import) your own index of the world's top stories, notifying you if required via 'toast' pop-ups and on as many live tiles as you care to pin. Plus the core application is a full UWP and works in both portrait or landscape modes, with or without Windows virtual controls, via Continuum, and on tablet or laptop PC. 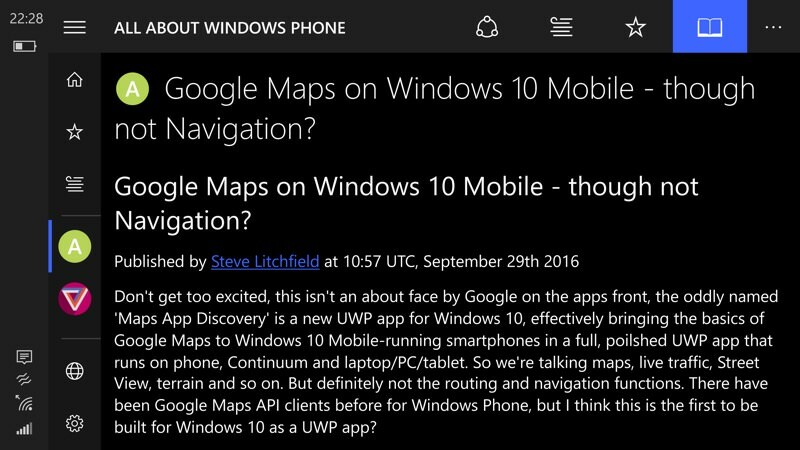 It's a model UWP in many ways, with every angle, every aspect covered - and, amazingly, it's totally free. At the heart of Newsflow is a massive online directory of existing known news feeds, ready for searching and adding to your in-app index - you can search for a keyword in a news piece (i.e. 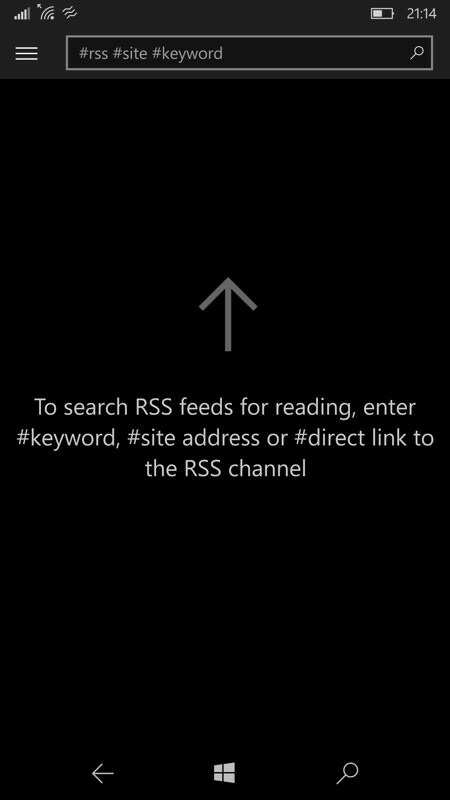 type in the name of something you're interested in) or for the name of a site or publication or, simply, paste in the RSS feed for something you want explicitly. 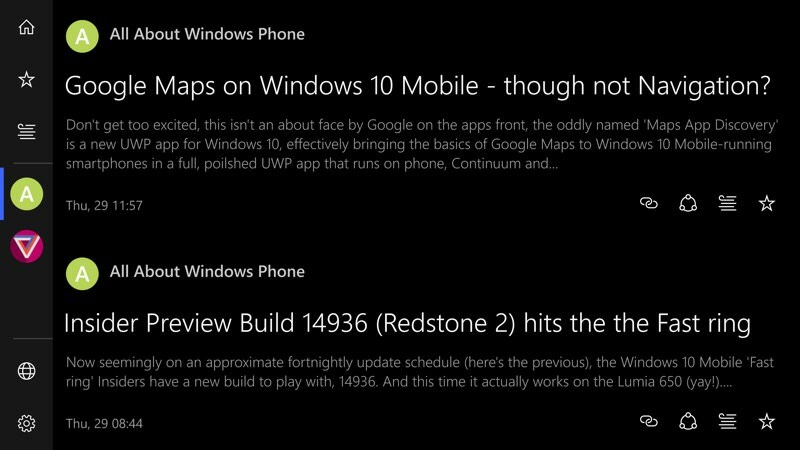 The latter is rarely needed though, since the main directory is very comprehensive. 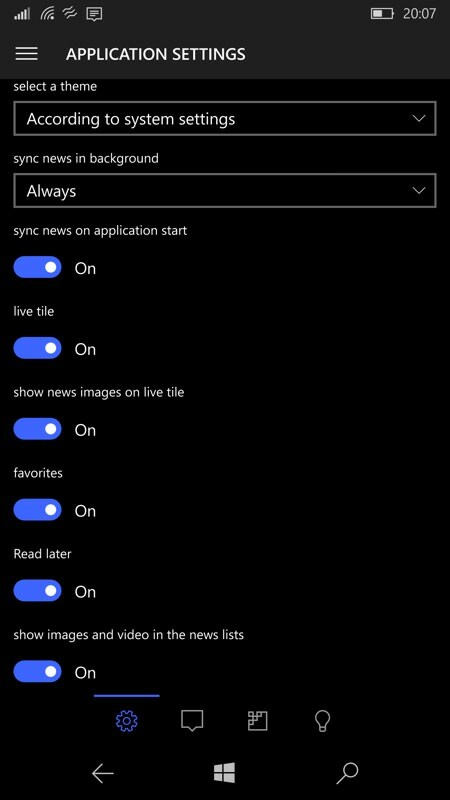 Having found a news feed/source that you want to add to Newsflow, you can save it immediately or (recommended) take a moment to swipe through the custom settings - for example, whether to include images with the headlines in your main 'home' news feed (many sources have low-grade images, which then look very blocky in the otherwise polished UWP interface) or whether to 'pin' the source to the Newsflow hamburger menu or, indeed, to the Windows 10 Start screen on your phone. In addition to such customisability on a source-by-source basis, there's also a tremendous amount that can be tweaked across the whole Newsflow application - this is one of the most customisable applications I've seen for a while. Which is just as well, since RSS/ATOM/XML feeds vary hugely in terms of their content - it's essentially up to the content creator as to what they do or don't put in the (machine) feed, in terms of text depth and image references. I'd recommend building up Newsflow from specific sources rather than importing a mass of hundreds of feeds from a previous news gathering system (e.g. Google Reader or Feedly), since it's easy to be somewhat overwhelmed by content. 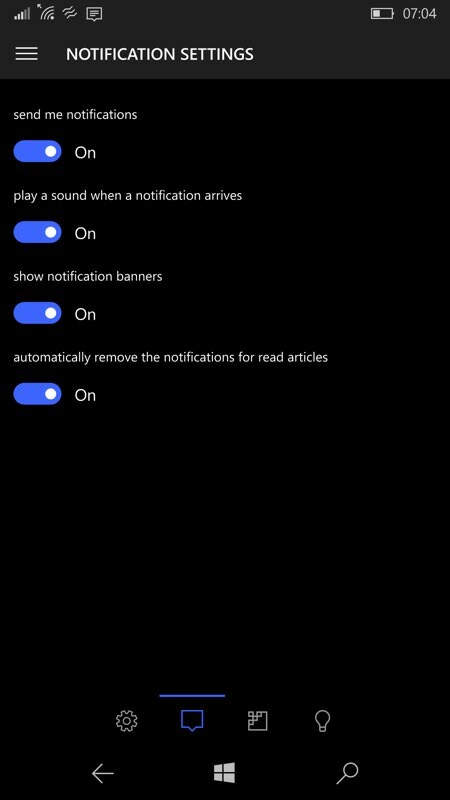 For example, the notification system is particularly well done, see the toast examples below - this is a really useful way to be alerted of breaking stories, but you really don't want to have your phone beeping and buzzing a hundred times a day, so it's best to be very selective in Newsflow. Think of it as an alert system for your most critical news sources, with the likes of Feedly and Nextgen Reader as an access point into a much wider news pool, but at lower priority. 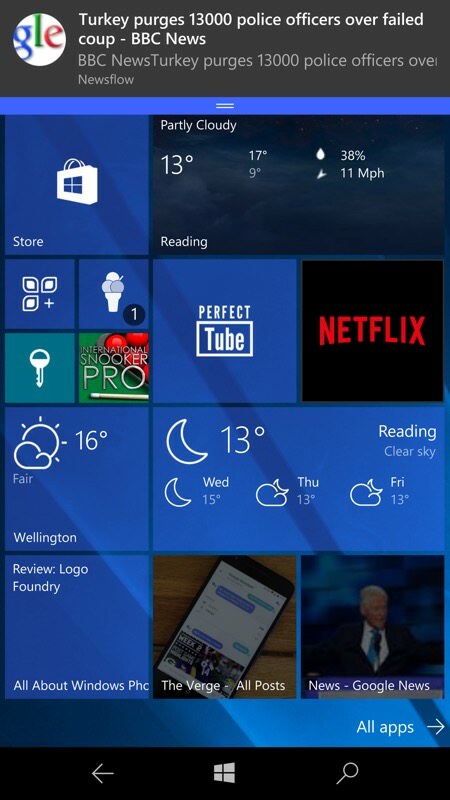 The live tiles cycle between recent headlines and images (if relevant) - these are subject to the usual variability in Windows 10 Mobile as to how often they work, but there's usually something to grab the attention. 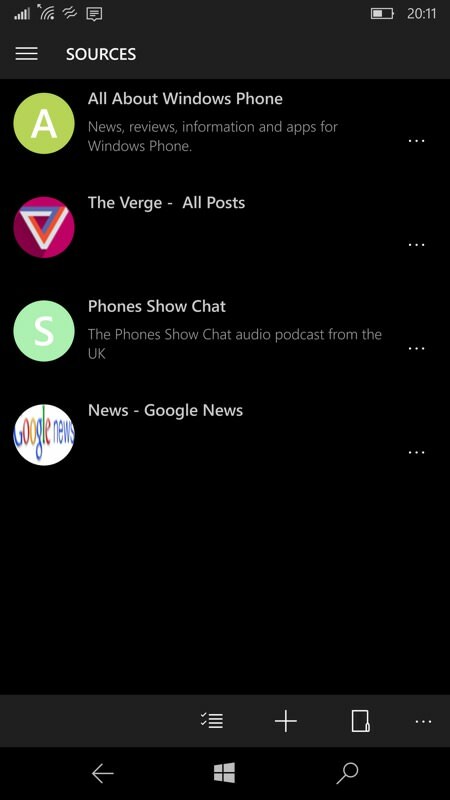 I show three live tiles above, but I don't see why you couldn't, for example, have (say) six live tiles for your top six news sources. Demonstrating how 'universal' Newsflow is, here are a couple of screenshots showing it running in landscape orientation on the phone, with headline and story views. Note that the 'left' status bar auto-hides itself most of the time but then re-appears when you start swiping up towards the top, i.e. as if you'd finished reading and were thinking about doing something else - this is a nice UI compromise. 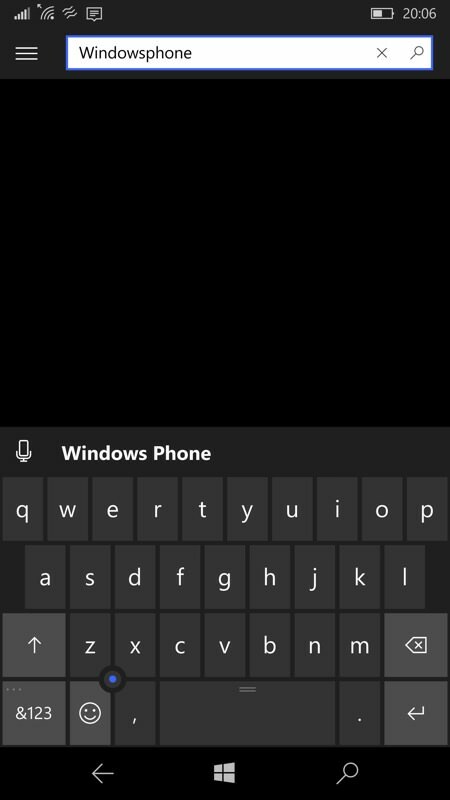 Note also that I've manually swiped away the Windows controls, for extra effect. Key to how you use Newsflow will be how you want to be notified. 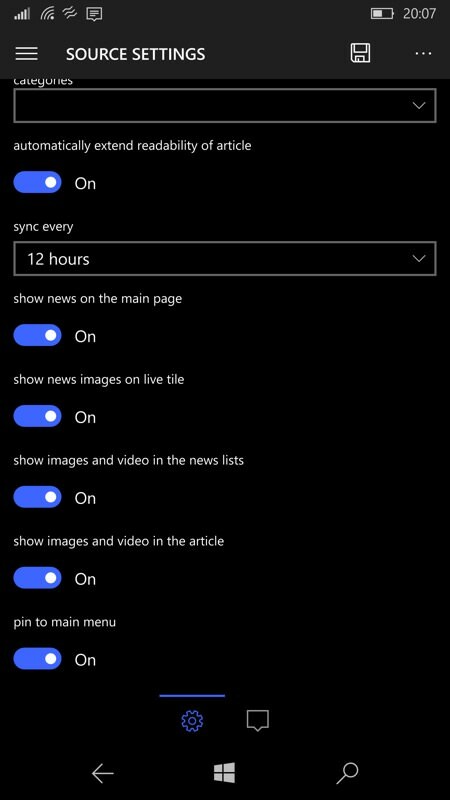 For example, if you only have a handful of news sources then it's practical to leave notifications turned on and go off and do something else on the phone, with stories arriving in tight batches as and when the Newsflow background agent runs. 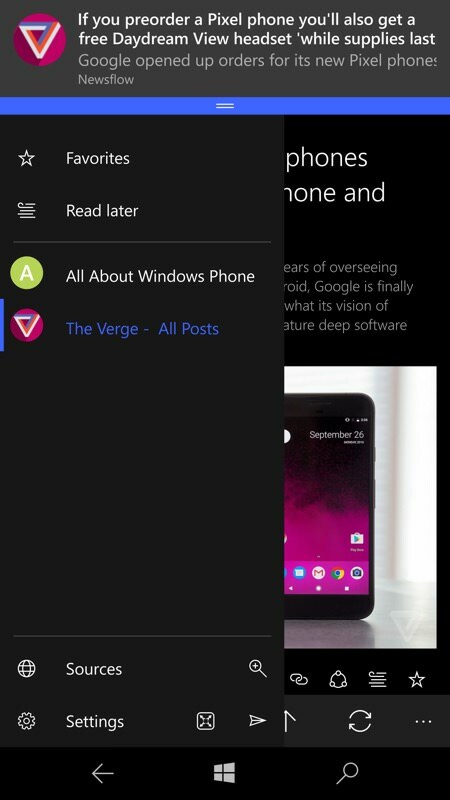 For more than a handful, you may want to turn this feature off and use the application mainly in the foreground, manually browsing lists of stories in more conventional fashion. 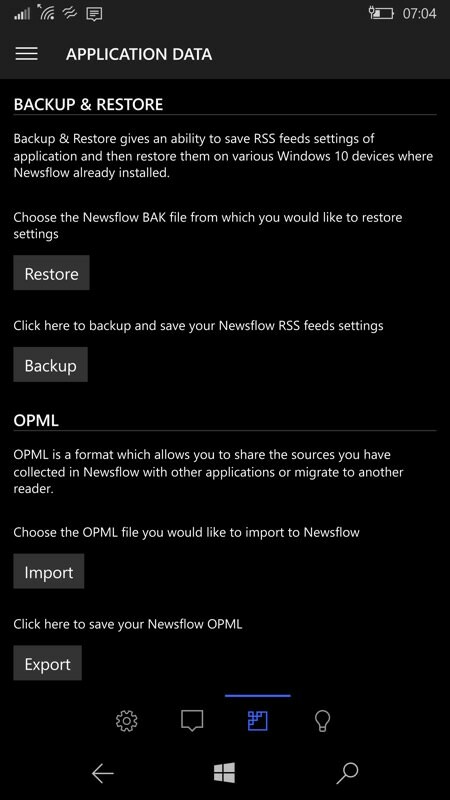 Perhaps not trusting Windows 10 Mobile's built-in app backup system (very wise, it's inherently unreliable in my experience so far), there's a settings pane dedicated to backing up and restoring your Newsflow feeds and preferences. Plus, should you want to, import an OPML file of feeds from another application or system (e.g. Feedly), though again my caveat over story overload applies. 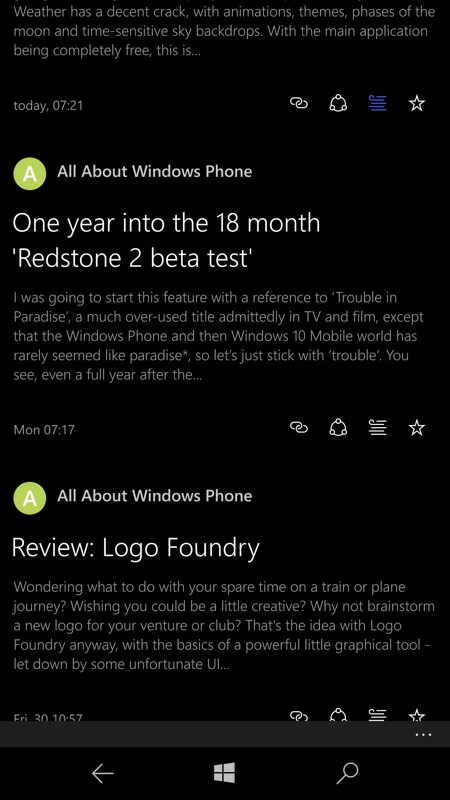 A model UWP application, Newsflow only really has one big omission in its current version - after reading a story, you have to keep using 'back' to get to the headlines and then tap to go back into the next story, and so on. 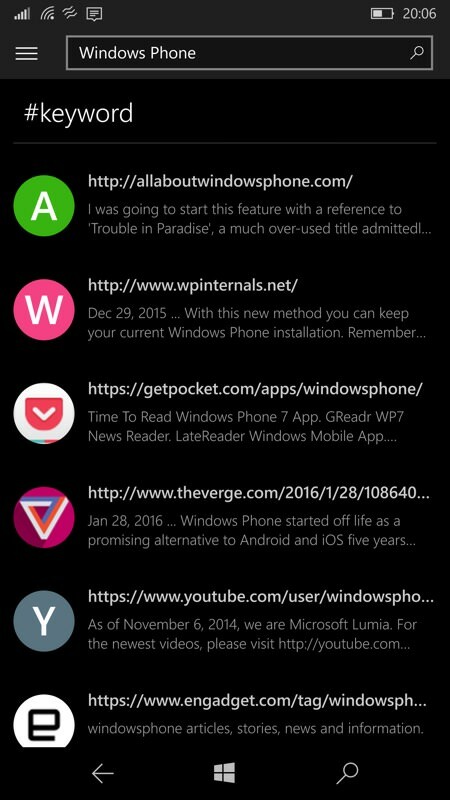 There needs to be a quick way to swipe or tap to go directly from story to story, either within a source feed or across all sources. 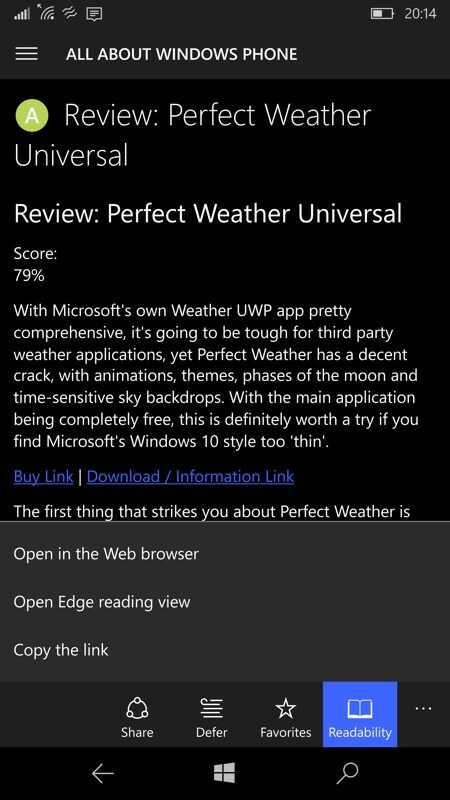 Nextgen Reader gets this right and I'd hope that Newsflow's developer implemented something similar. PS. 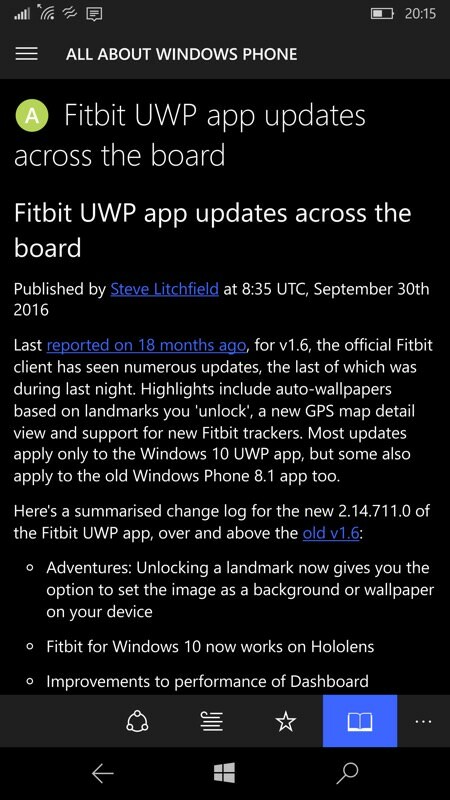 As is becoming traditional for UWP apps, to emphasise that they really do work across form factors, here's Newsflow in action on a Continuum secondary display, with exemplary reflowing of UI elements and content. Top marks.